billion bailout. They're worried about their savings, their jobs and their homes. the scenes in the housing and mortgage industry for much of the past decade.  What does the bill say, exactly?  Who is making decisions about how the $700 billion will be spent, and what does it mean now that the government is investing directly in our banks?  Who's footing the bill?  What is the impact on homeowners, businesses, retirement, and taxes?  Where do I put my money in the meantime?  Mortgages: While rates may be lower, there will be more fees. Lenders will be more cautious in lending, and people who cannot meet their mortgages are likely to lose these homes. This may create "contrarian" plays in foreclosures and vacation homes.  Stocks and Other Investments: Is now the time to get into the stock market or is it safer to stick with CDs, bonds, and gold?  Taxes: With the tax breaks, there will be less tax revenue leading to a huge shortfall to the government over the next few years. 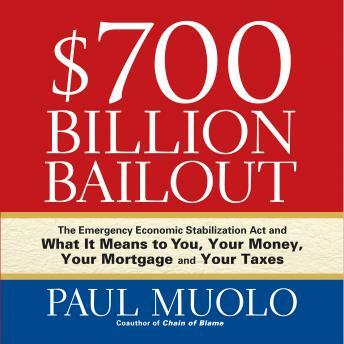 Muolo offers insight into these areas and many others, including how the structure of the bailout bill allows for unprecedented authority that has altered the financial landscape, perhaps permanently. Will the plan work, and how we can prevent this from happening again remains to be seen, but with $700 Billion Bailout Paul Muolo gives us a critical tool for deciphering perhaps the most sweeping piece of legislation since the Patriot Act.